An effective combination of Job's tears, lemon tree, lotus seeds and Maitake mushroom for easy preparation of a beverage for strengthening of the spleen system and overall detoxification. Add to your healthy breakfast. MycoClean is a balanced combination of mushroom and herbal extracts, designed for present-day humans’ problems, which is based on the deep wisdom of traditional Chinese medicine. This combination strengthens the “spleen” (Chinese synonym for digestion) and thereby strengthens the energy Qi of the entire body, drains moisture and mucus from the organism , detoxifies the organism, harmonises the psyche, strengthens SHEN (kidneys) and FEI (lungs). So what exactly weakens PI (spleen)? It’s irregular meals, overeating, lack of quality food, unilateral food selection, excessive consumption of sugar, dairy products and white flour. Also excessive thinking and lack of movement. Breakfast is important for the spleen. If we manage to "start" digestion in the morning, it will work throughout the day. Chinese dietetics recommends that the breakfast be warm. Cereal porridge or soups are ideal, whereas yogurts, sweets (fast sugars) or raw fruits aren’t suitable. MycoClean , as part of a healthy breakfast, will help us both strengthen the PI (spleen) and cleanse the entire organism. The dominant part of the mixture isadlay or Job's-tears. 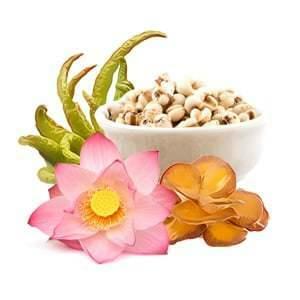 Adlay is excellent for strengthening of the spleen system and draining moisture from the organism. It can cleanse the organism from various harmful substances and toxins. The third component isFo Shou, which is a kind of lemon tree called Buddha’s hand, which regulates liver energy Qi, often stagnated from excessive or unexpressed emotions, supports digestion,strengthens the spleen and transforms TAN (mucus). The last but important part of the mixture is a medicinal mushroom Maitake or Grifola frondosa). This mushroom is able to regulate PI/WEI/GAN (i.e. insulin resistance), and so it’s used for metabolic problems. It’s often used together with chemotherapy or radiotherapy. Thanks to these features it’s suitable as a complement to any healthy breakfast. 1 teaspoon of powder per day. Measure the powder with the enclosed teaspoon and mix in 2 dcl of lukewarm water (children from 3 to 15 years half a teaspoon per day). Ideally, take it half an hour before breakfast. To enhance the effect, you can drink this beverage 2-3x per day (always mix 1 tsp in 2 dcl of fresh water). I take it in the morning for breakfast. Mixed in cereal porridge. I'm full of energy all day. I have stopped swelling, the yeast effusions disappeared, and the stools regulated. Enjoy a good breakfast of Mycomedica. I keep my fingers crossed for you! It has become a bit of a tradition to give the entire family MycoClean and MycoComplex in the spring and autumn. And the fact is, we‘re ill much less. And if there is something that the kids bring home from school, it runs its course quickly. My daughter always took antibiotics again and again. Basically for 14 days her digestion got gradually worse, she often had diarrhoea and was always tired. Based on MycoMedica's therapist's recommendation, she took Cordyceps and Reishi for 2 months. To that, I added 1 teaspoon of MycoClean (my daughter didn‘t really like it when it was mixed only in water, we gave it to her in porridge or a morning snack). In the last two months, her condition has improved, she hasn‘t been sick, her nose doesn’t run, her appetite has improved, and she isn‘t always tired. These days we switched to MycoComplex. I believe that the vicious circle has been broken and antibiotics have gone once and for all. Are you going to write a book about mushrooms and eating according to Chinese medicine?